The new Retina Display iPad mini may be in short supply due to poor yields of Sharp display panels, according to a DigiTimes report. The panels are based on the company's Oxide TFT process. LG Display (LGD) is another supplier 7.9-inch Retina panels, the sources noted. LGD uses a-Si process and accounts for about 60% of the panels supplied for use in Apple's iPad mini with Retina display, with Sharp accounting for 40%, the sources said. AU Optronics (AUO) and Innolux have tried to obtain orders for 7.9-inch Retina panels from Apple but failed, the sources added. For the iPad Air, LG is said to supply 60% of the panels with Samsung supplying the remaining 40%. 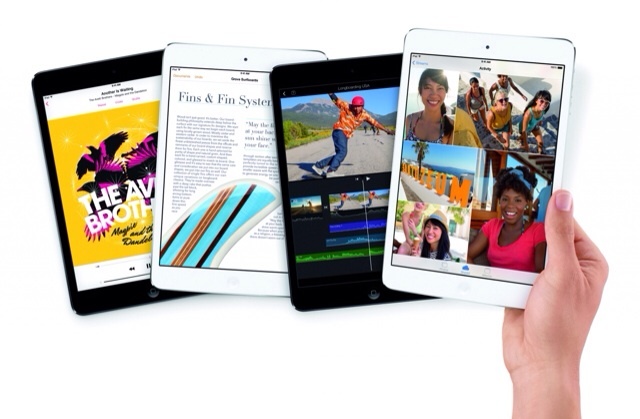 The iPad Air is set for release on November 1st. The iPad mini with Retina Display will be available later in November.